Thank you for considering becoming a volunteer with our agency. We are always looking for extra support in our service areas, although a formal intern status is only available three times a year (fall, spring and summer semesters). Direct Services- volunteers work directly with our participants. Direct service volunteers are required to complete 60 hours of training and complete a background check. The only cost is for the background check ($75). We typically offer volunteer training 3 times a year (spring, summer, fall). 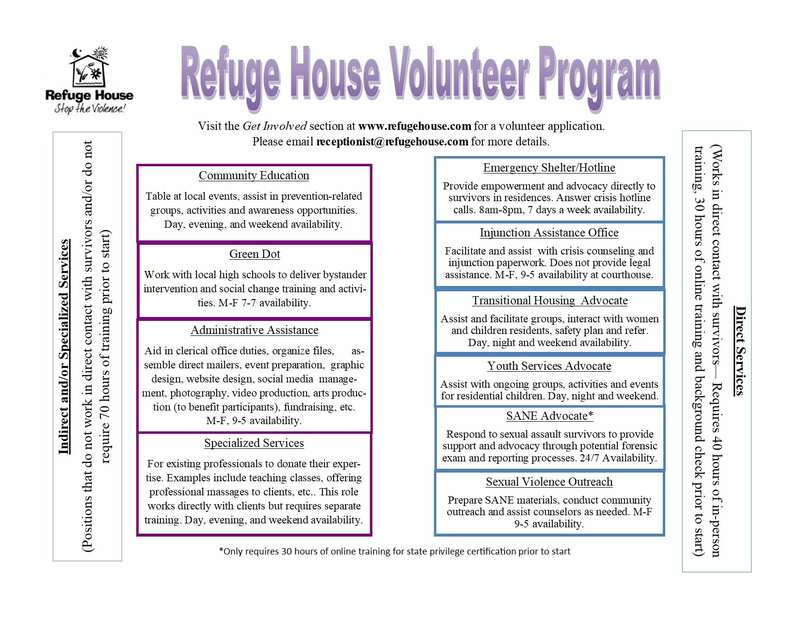 When you have completed the Volunteer App, you may email it along with THREE professional references and your resume to receptionist@refugehouse.com or mail it to Refuge House, P.O. Box 20910, Tallahassee, FL, 32316. Once your application is received, the volunteer coordinator will contact you with further information such as background check details, training links, and in-person training dates. If you have questions or need additional information, please email receptionist@refugehouse.com.